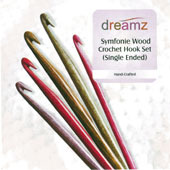 We just got in the Knitters Pride Dreamz crochet hooks made from symfoni wood. I just love these hooks! The finish on them is just stunning. We will be getting more in this week. We also have the set of Tunisian hooks with caps and cords. We still have free shipping on everything in our etsy store today! Skip stitch blades, crochet hooks etc.